This sequel to ‘As the Reels Turn’ from Rival Gaming does a great job of continuing the story of this ‘daytime soap opera’ themed slot series. The second slot of the series is aptly named ‘The Gamble’ and once again is based on and around the antics of Matt Grey, the general manager of the Hotel and Casino El Paradiso. In this review I examine all aspects of the ‘As the Reels Turn 2’ Slot. First up I look at the basics of the game and how you’ll achieve those standard wins. Then I move on to explore the four bonus round features you’ll find. I finish with some information regarding the iSlots series and an overview of this entertaining slot. You'll find my review of part 1 here. This game is very similar to the original game in many ways. Firstly, it is a 5 reel slot featuring 15 pay lines once again, secondly many of the symbols are the same and finally the bonus features are very similar – however there are some differences. Like the original version, the top symbols are the ‘El Paradiso’ and the ‘Casino Chips and Cash’ – hitting five of these will win you 1000 coins. ‘Jamie’ (the blonde), ‘Vanessa’ (the brunette) and ‘Rex’ (the villain) will win you 300 coins if hitting all five and the ‘confidential letter’, ‘the lobster’ and the ‘wine bottle and glass’ make up the standard symbols. Danny – Hitting three or more ‘Danny’ symbols will bring up the Danny bonus round. Here you’ll play Rex, whose aim it is to find Danny, whilst avoiding the attention of Jamie. Click on various spots and you’ll find cash, but the moment you bump into Jamie, the bonus round is over. Ivan the Fish – Catching three or more of the fish symbols will see you given 10 free spins at the game. Even better, these free spins will give you a 3x multiplier. Bonus Chips – When landing three or more bonus chips you’ll join Matt Grey in sorting out the real chips from the counterfeit ones. Every time you select a genuine chip, you’ll win the amount of the chip, however clicking on a counterfeit one will see the bonus round come to an end. Each of the above bonus rounds will be activated by hitting the relevant symbols 3 or more times, however should you hit the symbol 4 times, your bets will be doubled, and should the symbol appear 5 times, your bets will be multiplied by 50! Advance Next Scene Bonus - Hitting three of these symbols will transport players into soap opera land, where you’ll watch a cut-scene. You’ll then see a game map, and at the end of each scene on the map, you’ll play a bonus feature. These features include ‘Reel of Fortune’ where you’ll win the amount of cash the reel stops on and a game where you’ll have to pick out the right character from a series of flashing pictures. 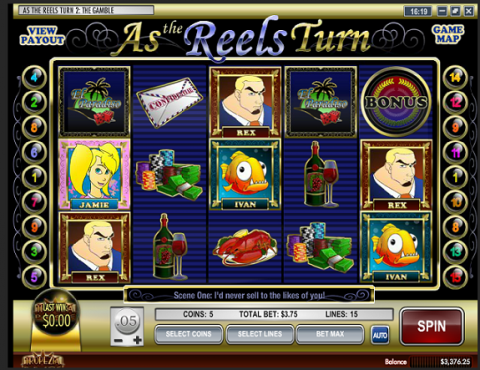 The entire ‘As the Reels Turn’ series is part of the iSlots range by Rival Gaming casino software. This range of games aims to introduce an ongoing storyline that players can become involved in, with interactive aspects. All of these games also feature a short animated clip before the game begins as way of an introduction. All iSlots games can be played on a PC or Mac either through the browser or via the download version. A selection of iSlots are also available on mobile devices, these games being designed using HTML 5, making the games ideal for the iPad and an Android device. This game is a good continuation of the series, and fans of the first game will enjoy the additional story lines and characters introduced in this one. The slots experience is good, with the many different bonus rounds offering something unique each time you play, meaning the game stays fresh for a long while. The game has a good sense of humor and it is no surprise that ‘As the Reels Turn 3’ is now available as well – although it would be quite an achievement if the series last as long as ‘As the World Turns’, the soap on which it is loosely based, which ran for a small matter of 54 years.